Richard Davenport-Hines (born 21 June 1953 in London) is a noted British historian and literary biographer, best known for his biography of the poet W. H. Auden. Davenport-Hines is also an expert on the famous Cambridge economist John Maynard Keynes. He was educated at St Paul's School, London and Selwyn College, Cambridge. Davenport-Hines has published more than twenty books and essays on a variety of historical, political, and philosophical topics over the course of his career. 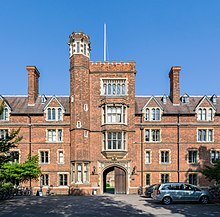 He was educated at St Paul's School, London, and Selwyn College, Cambridge (which he entered as Corfield Exhibitioner in 1972 and left in 1977 after completing a PhD thesis on the history of British armaments companies during 1918–36). He was a Research Fellow at the London School of Economics, 1982–86, where he headed a research project on the globalisation of pharmaceutical companies. He was joint winner of the Wolfson Prize for History and Biography in 1985 and winner of the Wadsworth Prize for Business History in 1986. He now writes and reviews in a number of literary journals, including the Literary Review and The Times Literary Supplement. He is an adviser to the Oxford Dictionary of National Biography, to which (as of June 2016) he has contributed 163 biographies. During 2016, he was Visiting Fellow at All Souls College, Oxford. He was a trustee of the London Library between 1996 and 2005, and has been on the committee of the Royal Literary Fund since 2007. He is a member of the Athenaeum Club, London, Brooks's Club and a Fellow of the Royal Society of Literature since 2005 and the Royal Historical Society since 1984. He was chairman of the judges of the Biographers’ Club Prize in 2008, and of the judges of the PEN Hessell-Tiltman Prize for History in 2010. He is also one of the judges of the Cosmo Davenport-Hines Prize for Poetry awarded annually since 2009 to members of King's College London – named in commemoration of his son who died on 9 June 2008 aged 21. He also inaugurated the Cosmo Davenport-Hines Memorial Lecture given annually since 2010 under the joint auspices of King's College London and the Royal Society of Literature. He campaigned for Britain to remain in the European Union during the referendum of 2016. He has contributed to several volumes of historical or literary essays. These include an essay on English and French armaments dealers operating in eastern Europe in the 1920s in Maurice Lévy-Leboyer, Helga Nussbaum and Alice Teichova (editors), Historical Studies in International Corporate Business (1989); an essay on HIV in Roy Porter and Mikulas Teich (editors), Sexual Knowledge, Sexual Science (1994); a historical critique of drugs prohibition laws in Selina Chen and Edward Skidelsky, High Time for Reform (2001); a chapter in the Cambridge Companion to W.H. Auden (2005); and a memoir in Peter Stanford (editor), The Death of a Child (2011). This page was last edited on 24 September 2018, at 17:15 (UTC).